The Port of Hamburg receives the first of a total of eight 13,380-TEU COSCO newbuildings at HHLA’s Container Terminal Tollerort. Delivered at the end of February, the completed containership Cosco Belgium will berth in Hamburg on April 11. Operating under the Hong Kong flag, this ULCC is 366 meters long, 51 meters wide and when fully loaded has a draft of 15.5 meters. She is the first of altogether eight 13,380 TEU (20-feet standard container) vessels ordered by Cosco from the Chinese NACKS shipyard in April 2008. Designed to fulfill the latest environmental standards, this series of newbuildings represents the largest ship type so far built by any shipyard in China. By 2014 all newbuildings will be delivered. 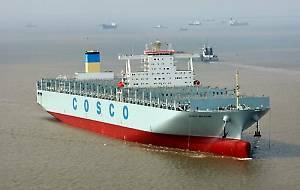 The Cosco Belgium will be deployed on the CKYH Alliance’s weekly Asia-Europe NE3 service from Hamburg, calling at HHLA‘s Container Terminal Tollerort. From Hamburg, the Cosco Belgium will continue her voyage on 13 April via Antwerp to Yantian, Hong Kong, Xingang, Dalian, Qingdao, Ningbo and Singapore, returning again from there to Hamburg within around 26 days via Rotterdam and Felixstowe. Altogether ten ships with slot capacities of 13,000 TEU operate this service. Apart from Cosco, the “K” Line, Hanjin Shipping and Yang Ming are members of the CKHY Alliance. China is by a wide margin the Port of Hamburg’s leading trade partner for seaborne container traffic. In 2012 around 2,600,000 TEU were transported between Hamburg and ports in China, including Hong Kong. That represents about 30% of total container throughput at Hamburg container terminals. With 526,000 standard containers (TEU) handled there, Singapore also features in the Top Three of the port’s trading partner league. All liner shipowners operating in the trade between Asia and Northern Europe call directly at the Port of Hamburg. The main cargoes between China and Hamburg consist of machinery and equipment, chemical products, metals and metal products, as well as textiles and clothing. The most important import/export products between Hamburg and Singapore are food and beverages, agricultural, fishery and forestry products and game, chemical products, textiles and clothing.